Do you feel like Cupid hit you with the wrong arrow? Maybe you’re wishing he’d try again or you’ve learned a lot from his mistake. 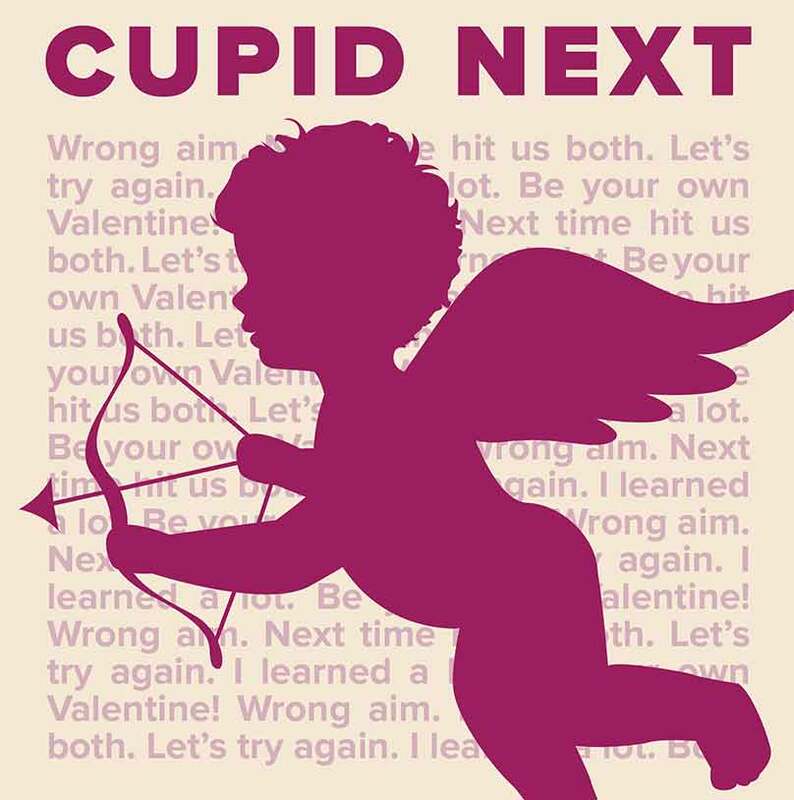 Find Cupid at your local library and share a photo of you and Cupid on social media with the hashtag #CupidNext! Join us for a Broken Heart Week film screening of “The Shack” (2017, PG-13). Sketching and coloring can be healing. We will provide cardstock paper cut in strips and other art supplies to create bookmarks in commemoration of our broken hearts now healed. It is a truth universally acknowledged that one broken heart written down will last one thousand years. We’ve read or watched many of these stories and have learned of heartache and woe. Join us for our display of Broken Heart Books and Movies from February 10th to February 16th . Match the Broken Heart title to the quote and receive a reduction off extended use fees. Please see staff about how to participate. Children and family members can create a Valentine’s Day card for their future self! Children under 8 must be accompanied by a grown-up. Ages 5-12, visit the Baisley Park Library and make a heart craft! Children under 8 years of age must be accompanied by a grown-up. Join the Baisley Park Friends Group as they celebrate Valentine’s Day! Families can participate in dancing, games, and fun! Please join us for the romantic comedy “Leap Year” (2010, PG), starring Amy Adams. After four years together without an engagement ring, Anna plans to propose to her boyfriend on Leap Day, February 29th. But fate steps in when she follows him to Dublin, Ireland, where she meets a handsome innkeeper. Register to join us for an hour of conversation and craft. We will reminisce and share stories of the heart followed by a beautiful craft project. All craft materials are provided for you. For registration, call (718) 831-8644. Visit the Briarwood Library to watch the movie “A Walk to Remember” (2002, PG). The movie is the story of two North Carolina teens, Landon Carter and Jamie Sullivan, who are thrown together after Landon gets into trouble and is made to do community service. Have fun creating your own broken heart bookmark. Materials will be provided. Come and share your talents at Broad Channel. If you have a poem, song, or story you would like to share, feel free to join our event. Spots are limited. Call the branch for more information. Come for a fun screening of “Christopher Robin” (2018, PG). An all-star ensemble cast shines in this comical and poignant look at breakups, breakdowns, and breakthroughs. Joel’s girlfriend, Clementine, has had their tumultuous relationship erased from her mind. Out of desperation, he contacts the inventor of the process to get the same treatment. But as his memories of Clementine begin to fade, Joel suddenly realizes how much he still loves her (2004, R). Celebrate Broken Heart Week with a movie to recharge a hopeful heart. We are showing the film “Love Actually” (2003, R). Need to make a last-minute Valentine’s Day card? Come join us as we make origami heart notes for our loved ones! Join us for a film screening and discussion. Rachel Chu is happy to accompany her longtime boyfriend Nick to his best friend’s wedding in Singapore. She is surprised to learn that Nick’s family is extremely wealthy. Thrust into the spotlight, Rachel must now contend with jealous socialites, quirky relatives and something far, far worse--Nick’s disapproving mother (2018, PG-13). Make black duct tape roses, pincushion dolls, and rude conversation hearts. Join us for a Broken Heart Week film screening of “I Capture The Castle” (2003, R). Have you lost a family member or a beloved pet? Families are welcome to share their memories during Broken Heart Week. We’ll create a healing chain of hearts together. We will show two romantic movies: “Me Before You” (2016) on February 11th at 6 pm and “Cafe Society” (2016, PG-13) on February 15th at 3 pm. Read ‘em and weep! These are tearjerker titles to make you cry, sniffle, and sob! For our Broken Heart Week, please join us in creating a scrapbook where we can collect thoughts and write about the people we love. We will be doing scrapbooking to heal our experiences. It’s Broken Heart Week! Come and enjoy the feature movie “The Big Sick,” a love story about two people from different cultures and the challenges they face in love, life, and family (2017, R). This month’s Draw Night coincides with Broken Heart Week in a special edition called An Ex To Grind. We’ll be drawing fun, playful, but in good humor, portraits of our exes. The mission of this craft is to turn our broken hearts into a work of fun art; just remember to please keep it clean. Bring your own markers, ink, and colored pencils. Ages 12 and up are welcome. Registration is required. In celebration of Broken Heart Week come and enjoy the feature film “Eat, Pray, Love.” Julia Roberts stars in this fact-based story about a young divorcee’s yearlong journey around the world in search of the self she once lost (2010, PG-13). Sketching and coloring can be healing! Customers will create heartbreak bookmarks out of cardstock to own or to give away! Walt Disney’s pioneering first feature-length animated film, based on the Grimm tale about a princess, seven dwarves, a jealous queen with a poisoned apple, and Prince Charming (1937, G). Enjoy this movie selection for Broken Heart Week starring Ryan Gosling and Emma Stone (2016, PG-13). It’s the annual blind date event with books. Patrons choose from a collection of “mysteriously” wrapped books with vague “dating profiles” to check out with the hope that some may find a reading “match” ... and others, maybe not. We will show a romantic movie, “Like Crazy” (2011, PG-13), starring Felicity Jones & Jennifer Lawrence. Under “Blind Date with a Book” a number of books will be on display and wrapped up so patrons will only find out what they have once they get home. In our Children’s Library kids can create Valentines and other crafts, including writing positive messages about loving yourself and those important to you, in order to create a paper chain that we will later hang up. Join us in creating Valentine’s Day cards for a special person...you! What is your one quality that you are most proud of? What makes you unique? What brings you joy? Create a card celebrating what makes you, you! For Broken Heart Week, we will be telling stories that have the theme about how our words can break other people’s hearts. Then we will learn how to be kinder to each other. A heart craft will follow. This program is for children ages 4-12. Teens create artwork inspired by their broken heart stories for display at Queensboro Hill Library. Please join us for an hour of broken heart crafts. Craft materials will be provided for all participants. Join us during Broken Heart Week as we create vision boards of the things that we love! Join us during Broken Heart Week, as we piece a heart back together! Join us during Broken Heart Week, and add to our heart chain with things that you love about yourself! Take your broken heart and create it into art. Explore the kaleidoscopic colors of a broken heart with watercolors. Attempt to mend some broken hearts at the Seaside Library Broken Heart Scavenger Hunt. Participants will have to locate the other half of a broken heart by following clues. Test your library knowledge while repairing hearts! Winners will receive a prize! For this year’s Broken Heart Week, we will read and discuss “Family Tree” by Susan Wiggs. It is a powerful story of love, loss, and the pain of the past with the promise of the future. Let’s bring the positive side with a broken heart but with happy endings! During Broken Heart Week, please come and watch “The Shack” (2017, PG-13). Come celebrate Broken Heart Week at Woodside by crafting with Carmela. Come celebrate the end of Broken Heart Week at Queens Library with a special screening of “The Zookeeper’s Wife” (2017, PG-13).